Due to their function, 4/2 air valves are typically used for the operation of double acting type air cylinders or actuators. A double acting type of air actuator, like a DA cylinder, requires compressed air to be both supplied to the device, and exhausted, alternatively, from each of the two air ports on the actuator. The first number in the 4/2 air valve indicates the number of ports the valve will have. Therefore, a 4/2 air valve will have 4 ports. The second number, the number 2, indicates that this valve, and correspondingly, the valve spool or poppet or other air control mechanism inside that valve, will have only two positions. Port 1 or port P on the valve body will be the port to which the compressed air supply will be plumbed. This port will normally be a female NPT or female metric threaded hole into which will be installed an appropriately sized air fitting . The fitting selected must have a thread size to match the threads in the port in the valve. The other side of the fitting must match the type and size of air line that will be connected to that fitting. Ports 2 and 4, (possibly marked ‘B’ and ‘D’ on other valve bodies) are female threaded working, or power, ports. These ports are plumbed to the two ports in the actuator using the appropriately sized fitting and air lines. The last, or 4th port on the 4/2 valve body – shown as number 4 or perhaps marked ‘E’ – is the exhaust port for this valve. In summary, the typical 4/2 valve will have one supply port, two actuator ports and one exhaust port. If a 4/2 air valve is air-piloted, that means that the valve actuator is compressed air. A smaller air port will be located on one or both ends of the valve depending on whether it is single or double air piloted type of valve. As noted, these control air ports are usually smaller than the working ports, unless the working ports themselves are 10-32 or 3 or 4 MM in size on that valve body. Then the control air ports might be the same size. If the control air ports are marked at all, that marking will likely be a two digit numbers perhaps as 12 or 14. All 4/2 valves have external (on the outside and accessible) valve actuators that will be used to operate or ‘shift’ the air valve when required. The 4/2 valve actuator could be a button, a toggle, a lever, a solenoid actuator or other types of valve actuators such as the air piloted actuator referred to above. 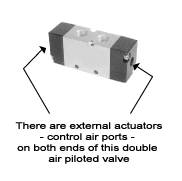 A 4/2 valve may have one or two external actuators, such as the double air-piloted valve shown in this graphic. Since a single 4/2 valve is both supplying air to the actuator while at the same time exhausting air from that same actuator, they are not normally considered to be an NC (normally closed) or NO (normally open) air valve. Almost all 4/2 valves will have some sort of an internal spring actuator, to return the valve to its “resting state” when the external valve actuator is no longer being operated. However, if the 4/2 valve has two external actuators though, it normally would not have an internal spring actuator. Without the internal spring, the valve spool or poppet will stay in the position dictated by the last valve actuator used. The friction between seals and valve body inside the valve will, in effect, detent (stays in the last position set) a 4/2 double solenoid valve. Therefore, a circuit designer will know what position the valve will be in should either the compressed air supply or electrical signal fail. Knowing that a double solenoid valve, without an internal spring, won’t move by itself allows the designer to design safety into the circuit. Can you plug one of the two cylinder ports in a 4/2 valve to make it a 3/2? Of course; and, since compressed air is always flowing through the valve to one of the two cylinder ports, then depending on which of the two ports you plug, you can make the resulting 3/2 valve either NC or NO. Given that a 4/2 air valve, by design, has only one exhaust port then the two lines from the cylinder will alternately exhaust through that one port to atmosphere as the valve shifts back and forth. You can use an exhaust flow control,to control both the extend and retract of the cylinder equally in both directions. In order to have the cylinder rod extend at one speed, and retract at another, it would be necessary to install in line or in cylinder port flow controls instead of an exhaust flow control as that would control the speed of the cylinder piston equally in both directions.